I was happy to present the Greater Portland Retail portion of the MEREDA 2019 Forecast conference last month in Portland, where we took a look back at 2018 and where retail trends are moving forward in 2019. Locally, the retail market has remained very strong. Greater Portland numbers show a vacancy rate just slightly higher than it was a year or two ago at just over 5%. Vacancy rates in the Old Port and Downtown Portland barely register. But, that being said, if you keep an eye on trends, you can start to see some slight changes. Retail spaces in the Old Port tend to remain available a little longer than they did a few years ago. Of course, the prices per square foot are still extremely high – there are actually prices being paid in the Old Port of $48 per square foot! Crazy, I know, but typically those spaces tend to be fairly small and in the most well-located places in the City! Regardless, the retail market in the Greater Portland area remains very strong. The Greater Portland market is comprised of the communities of Portland, South Portland, Scarborough, Westbrook, Falmouth and Cape Elizabeth. The retail report compiled by Malone Commercial Brokers tracks over 6.5M SF of retail spaces throughout this area. Of that square footage, vacancy is only approximately 365,000 SF. The Per Square Foot average price for those spaces remains high in the $15.00-$19.00 range. Yes, there are some big box stores that have remained vacant for a few years. Case in point is the former Bon Ton/former Filene’s space BUT there is talk of repositioning that type of bigger box space into other types of uses. Uses like medical office and similar that could benefit from a Maine Mall location. Certainly, the trend with big box retailers is to prototype their stores slightly smaller and use each square foot more judiciously than in the past. The impact of a flourishing restaurant scene on retailers is self-evident. Portland, Maine (as we all know by now) was named 2018 Restaurant City of the Year by Bon Appetit magazine. I’d like to say that it put Portland on the map but the truth of the matter is that Portland has been on the map for a number of years. It may now be getting all the recognition that our beloved city deserves. Greater Portland has long been a favorite of foodies and has also become very well known for its breweries and craft beer making which has made it a “must stop” on many travelers’ destinations. When you factor in all of the new restaurants, amazing chefs, and some of our long-standing favorites that have been with us for 30 years and more, you have an exciting restaurant city that is just going to continue to become more and more popular. The success of the restaurants which helps bring many of the tourists also has significant impact on local and regional retail shops. One of the aspects of retail that I took at look at for the retail presentation had to do with trends in retail and how retail is faring both locally and nationally and the obvious impact from e-commerce sales. The one notable and memorable quote that I came across during my research was (to paraphrase) “It is no longer an us vs them mentality” as in e-commerce vs bricks and mortars. Instead it has become important that bricks and mortars retailers adapt and create an Omnichannel Strategy for their customers. Retailers don’t really care if you shop online on their website and ship the package to your home, OR if you shop online on their website and pick up your purchase at their local bricks and mortar store OR if you come and shop in their store. Any of these three variations means you are spending your retail dollars with them! Hence the Omnichannel Strategy – offers you the option to purchase wherever you want and wherever you feel most comfortable but shop with them! To make that shopping experience an even more positive one, retailers are developing what is called Experiential Retail. Experiential Retail is generally defined as a store in which stuff happens in addition to selling, and shoppers do things besides buying. The idea is that a retailer offers consumers a chance to buy an experience rather than just an object or service. This can be accomplished through any number of activities but typically is also linked to technology and using technological advances in apps that make the shopping experience a fun and convenient one. The last word is, retailers need to remain flexible and willing to make changes, as well as bring in new systems as they become available. The key word for Retailers today is Adapt, Adapt, Adapt! Maine is experiencing a fundamental mismatch between its housing stock and its housing needs, and that mismatch is creating enormous problems for our families and our state’s economic well-being. For tens of thousands of Mainers, the price, quality, size and location of the homes available to them are simply out of synch with their needs and resources. This housing market failure affects wide swaths of Mainers, but seniors on fixed incomes, people with disabilities, and lower-wage workers are particularly affected. Housing practitioners and advocates are responding to this dilemma with a new proposal to double the current rate of production of affordable homes in Maine, through the creation of a new state affordable housing tax credit. 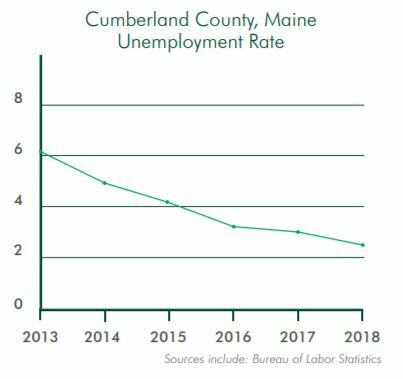 Additionally, recently released American Community Survey data reveals that more than 35,000 renter households, spread throughout all areas of Maine, are severely rent burdened – that is, paying more than half of their incomes for rent and utilities. 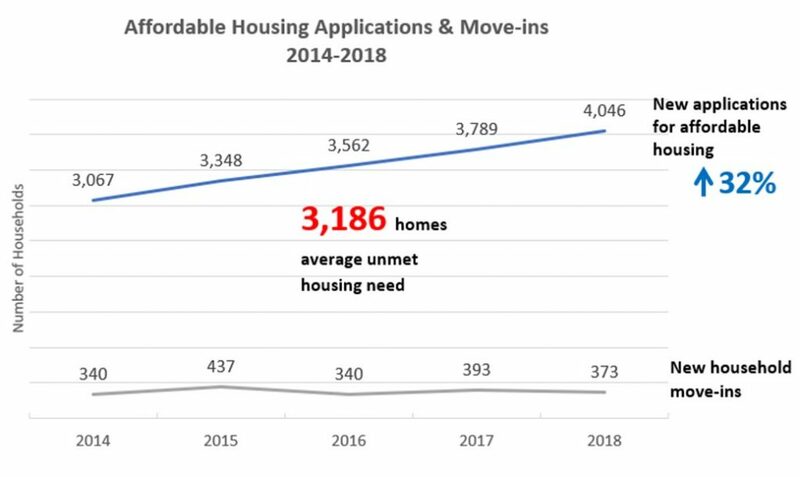 While Maine is experiencing this widespread, unmet need for affordable homes, the annual rate of production of new affordable housing units is only about 250 statewide. The key to making affordable housing development feasible under either scenario is finding the “Other Subsidy” shown above in green. While the 9% LIHTC is more valuable and requires less additional subsidy, its availability is limited by design and will only support the annual production of about 150 new housing units in Maine. 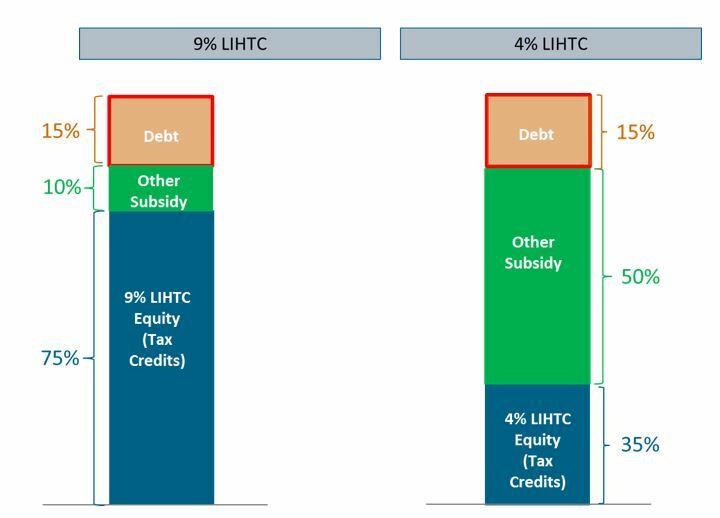 The 4% LIHTC is less valuable than its 9% cousin, but is an unlimited resource to be leveraged by states that can find the resources to fill in the other subsidy required. Over a dozen other states (including Vermont, Massachusetts and Connecticut) have adopted successful state affordable housing tax credit programs to help fill the financing gap in projects that utilize federal 4% tax credits to build new housing. The Maine Affordable Housing Coalition and its partners in the aging, community development, construction and engineering sectors are now proposing a similar approach through a bill that has been filed at the state Legislature. Modeled on Maine’s successful and highly efficient state historic rehabilitation tax credit, the proposal would utilize $80 million in state tax credits over 4 years to leverage federal 4% credits. 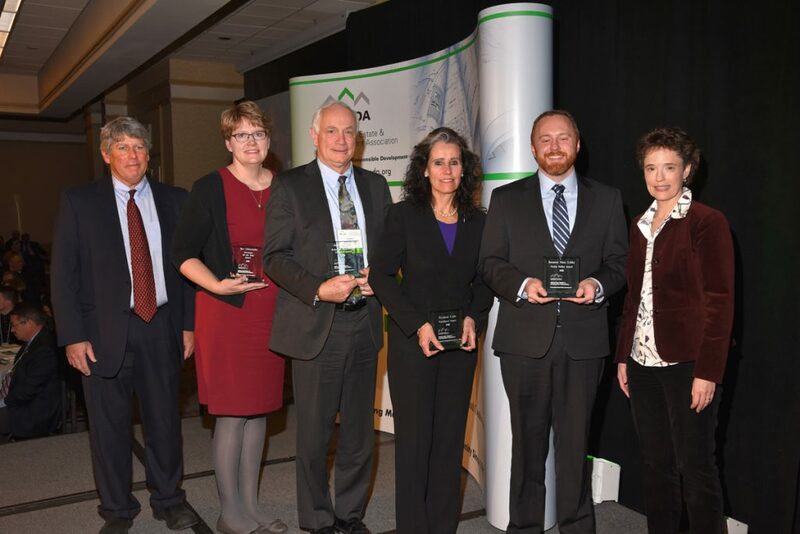 Adding these two resources to the modest loans and grants already available to housing stakeholders would allow more than 1,000 affordable homes to get built or preserved in Maine over 4 years – a doubling of the state’s annual production of affordable housing. At the same time, it would create jobs and critical economic activity statewide in the construction, engineering and design sectors. The initiative sets aside 10% of the credits to preserve some of the nearly 2,500 affordable homes located in rural communities throughout Maine, which were originally financed 40 years ago by USDA Rural Development but are now at risk of losing their affordability restrictions. The proposed program would allow individuals or corporations to invest in the development or preservation of affordable housing, in return for a refundable credit to apply to their state income tax obligations. The credits would be administered by MaineHousing. The bill, sponsored by Assistant House Majority Leader Ryan Fecteau, is titled “An Act to Create and Preserve Affordable Homes for Workers, Seniors and Rural Communities” and is expected to be referred to the Taxation Committee later this month. Will technology make real estate transactions a whole lot easier? The number of single-family home transactions in Maine has been flat for the last three years and is not expected to increase any time soon. This is a reflection of the economy, age of Mainers, and an inventory shortage. But could it also be that buying and selling homes is a royal pain in the rear for most people, preparing their homes for strangers to walk through, tons of paperwork, and the terrifying unknowns being able to find their next suitable home? With this in mind some companies are trying to shake things up the way Uber disrupted transportation and Netflix changed home entertainment. Let’s take a step out of Maine for a moment. $100 billion of commissions are paid per year in the United States. Residential real estate has been sold the same way for decades, but we are starting to see change in other parts of the country as consumers would like to see a simplified method for transacting real estate. Millennials will account for 45% of buyers in 2019. Millennials, and frankly all consumers want information and action ON DEMAND, they don’t want to leave voice mails or send emails and WAIT, they prefer just to push a button on their phone and take an action. So, an enormous amount of money is being invested into technology to get a bite into the real estate industry and that $100 billion of commissions. The historical void of innovation in real estate has opened a world of opportunity for startups that are attracting billions of dollars from venture capitalists. The VC world is all about PROPTECH (short for property technology) — a relatively new term referring to the sector of startups that create new products or business models for the real estate market. This is the future of real estate market. The players in this space are VERY powerful. Global venture capital investment in real estate innovation was $12.6 billion in 2017. One model the proptech companies have launched is the iBuyer. Sellers can trade in their house on-line! An iBuyer is a company that will make a homeowner an offer on their home online within minutes (or days), sight unseen, using an automated valuation tool. If they choose to accept the price, they can close in as little as a couple of days or pick a convenient closing date. The iBuyers tout the selling experience as quick and easy. No need to paint, stage, repair, clean up, have showings and open houses. Yes, these valuations are less than market value, but for a homeowner that needs to relocate for a job, is navigating a sensitive divorce, or a seller that can’t afford to buy without selling and want to act quickly…this could be the answer! Opendoor, one of the iBuying companies has raised over $1 billion in VC money. Other competitors OfferPad and Knock have also raised quite a bit of money. It is not just startup tech companies investing in iBuyer technology, the traditional real estate players are also bankrolling new technologies. Zillow, Keller Williams, Realogy, and Redfin have developed their own iBuying arms and investing heavily in proptech. Rental giants that used to gobble up distressed sales to grow their single-family inventory can’t do that anymore as foreclosures have dried up. 1 in 10 homes sold by iBuyers are bought by institutional investors. This number is increasing. It is not just big landlords buying through this method, the tight inventory is causing single family rental investors across the country to look for other methods to find inventory to buy. Rental demand is predicted to stay strong in the next decade. iBuying is still a niche product. If we look at Phoenix, a city with where multiple iBuyers have been operating for years, the sector has only about 4 percent of the overall market. Would this model work in Maine? No, probably not, we have a lot of variety in our housing stock, the values would be difficult to capture without a human visit to the property. But the venture capital money is allowing proptech companies to keep developing a solution to simplify the home buying process. The iBuying model (or another automated option for selling real estate) will gain in popularity. And that appetite will likely only grow as consumers skew younger and are more empowered by technology. It won’t be this exact model, but once the technology is discovered that does catch on, it will be a rapid change – think about quickly Uber changed how we get around and how Amazon changed our shopping experience. It will be exciting to watch and be a part of these changes as technology is infused in residential real estate and if/when it will creep into Maine’s market. Despite the seasonal climate here in Maine, we have plenty of cyclists in our midst and the number of commuters via bicycle has grown 51% nationwide from 2000 to 2016, a trend that doesn’t seem to be slowing down. Having the infrastructure to support that kind of commute could be the deciding factor for a potential employee. It also conveys that your company is environmentally conscious. Does your space accommodate flexible hours? This means excellent outdoor lighting, 7-day-per-week snow removal, parking in close proximity to the building, and HVAC hours that accommodate evening or weekend work if necessary. If your employees value flexible hours, these details are critical. Make sure your people feel safe and comfortable working the hours that fit their schedule. Provide private space for all employees, especially new Moms. Leaving a new baby with a caregiver to return to work is tough no matter how much a woman likes her job. Make that transition as easy as possible on her and provide a comfortable lactation room. Other private spaces should be made available for people to make phone calls, have sensitive discussions or just shut out distractions while focusing on an important project. Create a space that illustrates and honors your company’s culture. The little details of design can be overlooked in the grand scheme of building out new space and/or moving. Your operations team will likely be overwhelmed with the process. Hire a consultant to assist with space planning and interior design. These details go well beyond wall color and carpet choices – the small thoughtful touches do make a difference. When you walk a prospective hire through your space, you’ll want to be able to point out the things that make your company a special place to work. Do you need to be in a downtown location? If so, “What’s the parking situation here?” should be one of the first questions you ask when touring office spaces and it should be factored into the overall budget. Downtown vacancy is at or near an all-time low right now, so parking garages are full as well. Consider whether you want to ask employees to walk several blocks or pay for parking. Maybe you just need a few key people downtown with a larger presence in the suburbs. There are many logistical decisions to be made when designing your space, but don’t let that stop you from getting creative and thinking outside the normal parameters of what office space can be. You could offer a fully-stocked kitchen, yoga rooms, a pet friendly atmosphere… even nap pods. Picture your perfect new hire. What would entice them to join the company? My mind wandered recently while on a long solo drive, as it often does. I had the music cranking and, in typical Maine fashion, cell phone coverage was spotty. It was nice to effortlessly jump from thoughts of the holiday season with my young kids… to my (gulp) 20-year high school reunion and old friends… to the prospects of another long playoff run by my beloved Patriots. But as I passed commercial buildings and warehouses, my attention drifted to the bricks and mortar of the Greater Portland industrial market. The times they are a changin’ – Bob Dylan said it simply. And the statistics in our market suggest the same. The nearly 8-year run of a clear Landlord’s market has finally shown indicators (albeit slight) that the pendulum is swinging the other way. This year’s overall vacancy rate of 3.47 percent is significant increase from our historically low 2017 rate of 1.25%. Of course, a 3.47% rate is still what I would call a “Landlord’s market”. However, what concerns me is that our added industrial units are highly comparable spaces and competing with one another. Since early Spring we have seen several 10-20k SF Class-A/B industrial spaces come on the market and linger. In years past, we’d often have prospects on the sideline ready to pounce. In 2018, these spaces sat (and are sitting) vacant for months at a time. The challenge is lack of tenants. In Maine, we simply have a limited number of industrial style businesses to put into spaces that size. And when 5-6 of the same quality and size come on-line at roughly the same time, all of a sudden the 1-2 larger tenants in the market carry leverage they haven’t had in years. In the air tonight – Phil Collins sensed something was amiss. And so did we in the industrial market. The phones slowed down mid-year. Quality inventory that we turned over with such regularity, started to sit. What was wrong? We began to hypothesize and then confirm through conversations with our Tenant clients. There were some big-picture concerns happening. The macroeconomic pressures we have been tracking, primarily inflation and lack of labor force, finally became material reasons not to expand or relocate. Tenant’s began to tell us that they couldn’t hire enough people to support the workload that would come with additional square footage. Additionally, the cost of virtually everything rose. From taxes, to gas, to electricity, to raw materials, to a loaf of bread… everything got more expensive in 2018. Which indirectly squeezed real estate budgets. For the Love of Money – President Trump’s favorite tune is best known for the simple yet powerful chorus, “Money, money, money, moooonnnneey…. Money!” So how did we close any deals this year, with all the challenges referenced above? Sales prices continued to climb as we have a dramatic lack of purchase opportunities. Rising interest rates did not temper owner/user interest in acquiring industrial real estate. However, as sales prices climbed (cresting $100/sf for Class-A owner/user space) our sales volume was down. This was largely due to lack of motivated sellers. And leasing demand didn’t just drop off a cliff. We have had steady interest in smaller units, under 10,000 SF. And there are currently a handful of large end-users touring the market in the 50k+ range. Interestingly, the most consistent demand is coming from traditional industrial businesses. Until recently, these companies have been begrudgingly on the sidelines, often losing out to start-up and well-funded industries like craft brewing and the marijuana cultivation trade. Much like my long-drive, the industrial market has been a nice ride. But there are clearly bumps in the road forthcoming. For the first time in over eight years, the data suggests a softening market. Tenants finally have some leverage and can expect more incentives and better overall deals. And Landlords? Well, they may be singing a different tune. Regardless, it should make for a rocking 2019. Identifying the right construction project delivery method is critical to successful execution. Three of the most common delivery methods are Design-Bid-Build, Construction Manager (CM) at Risk, and Design-Build. Each of these methods has benefits and drawbacks. Choosing the right one will depend on your unique needs and the project requirements, and will allow you to better manage risk, quality, budget, and schedule. This article identifies the key features, benefits, and aspects to consider within each of these three delivery methods and describes the types of projects for which each method is best suited. Design-Bid-Build is perhaps the best known and most traditional form of delivery. However, the method does present certain limitations. Within the Design-Bid-Build delivery method, the owner contracts separately with a design professional and a contractor. The design professional fully develops and delivers complete construction documents before the owner solicits bids from prospective contractors. A contractor is usually then selected based on the lowest price, which is often viewed as an objective criterion. The payment structure is most commonly lump sum, but it may also be cost-plus (based on a unit price), or cost-plus with a guaranteed maximum price (GMP). Typical rationale assumes that bidding promotes transparency and impartial decision making, delivers the lowest cost, and provides all contractor candidates with a balanced opportunity for selection based on price. Design-Bid-Build provides the owner control over design and a clear division of responsibility among the various roles. However, it does not engage the experience, insight, and counsel of a contractor during the design phase. This method may be preferable for simpler projects, and is often favored where collaboration is less important. However, Design-Bid-Build may not be an appropriate fit for more complex projects where early and consistent engagement from a construction professional is beneficial. It also might not be the right choice in a heated market because the method isn’t optimal when expedited completion is essential. In the CM at Risk method, a CM is hired during the project’s design phase (typically early on at the conceptual or schematic design stage) to provide pre-construction services regarding constructability, including systems and materials comparisons, schedule development, and milestone estimates. The owner contracts with the CM who works collaboratively with a design team hired under a separate contract with the Owner. The construction contract is then executed on a cost-plus with GMP basis, with the CM who provided pre-construction services during the design phase usually contracted as the builder under terms established at the outset. The heightened collaboration between contractor and design professionals in the CM at Risk method typically leads to improved coordination, less conflict, and creative solutions that yield best-value results for the owner. It enables the design team and the owner to compare costs and benefits of various systems early in the project, allowing them to select the most cost-effective systems. This method also enables fast-tracking projects through phased scheduling. CM at Risk engages a Construction Manager as an equal participant and contributor within a collaborative team. The process allows clients to hand-pick a CM based on the firm’s relevant knowledge, credentials, and expertise managing work similar to the proposed project. The method also consolidates and streamlines construction responsibility through one contract; yields more practicable and foreseeable outcomes; produces a GMP that is fully bonded; and most often results in schedule and cost savings while reducing risk. The CM at Risk method may be appropriate in complex projects requiring customization since it allows owners to maintain cost controls. The owner can also maximize the value for their dollar on an expedited schedule. Because the CM can propose strategies to gain interest from appropriate subcontractors, it is often the right choice for owners in a heated market. In the Design-Build method, the owner contracts with a single entity for design and construction, typically on a lump sum, cost-plus, or cost-plus with GMP basis. The single entity may be a builder who subcontracts the design role or a design professional who subcontracts the building role. In either case, the owner provides a “Basis of Design” identifying program requirements, and the design-builder controls aspects of the project not enumerated or defined in the contract. The Design-Build method eliminates any conflict between design professional and builder, since a single entity holds both responsibilities. Combining the roles may also allow for lower cost and expedited completion due to enhanced collaboration and the ability to commence construction before the completion of design. Moreover, the owner has a single point of contact for simplified communication. This method, however, requires the owner to put a great deal of trust in a single entity. Often, the owner will cede control of the design of the project at inception, which may lead to concerns of compromised quality and detail for any item not specifically called out in the basis of design. Fewer checks and balances may present challenges and create risk for less experienced owners. The efficiencies of the design-build method are nevertheless useful for highly scheduled and cost-sensitive projects. And the risk of losing design control is mitigated in projects featuring repetition or more-formulaic models, such as hotels or dormitories where design elements are well-established. The selection of a project delivery method is an early decision that will have ramifications throughout the lifetime of a project. Whether you are an owner, contractor, or design professional it is a decision worth informed consideration, taking into account the nature of the project, the needs of the parties, and the construction market. January 22, 2019 at 9:05 am · Shelly Clark · Comments Off on Want to Know What’s Really Happening in Maine Real Estate? The MEREDA Index Has More Than Just The Numbers. To download a copy of the report or watch a video about the MEREDA Index, please click here. In multi-part series, exclusive to the Maine Real Estate Insider, we’ll provide an up-close look at the most notable commercial development projects of the past year that are helping to fuel Maine’s economy in terms of investment and job creation. MEREDA is proud to recognize responsible development based upon criteria including environmental sustainability, economic impact, energy efficiency, social impact and job creation. Please join with us in celebrating Huston Commons. MEREDA: Describe the building and project. Huston Commons: Huston Commons is a Housing First development for 30 disabled individuals who have experienced chronic homelessness. Through a unique series of nonprofit collaborations, Huston Commons provides essential 24-hour support services, including a medical care room to accommodate regular practitioner hours and telemedicine services for residents, all of whom have disabilities. Avesta Housing is the developer and property manager for Huston Commons, and Preble Street provides 24/7 support services. The project includes a partnership with Greater Portland Health to address specific health concerns and more generally ensure that residents have access to the health and personal care services that medically-compromised individuals typically benefit from in their homes. The onsite medical care room allows Greater Portland Health to schedule regular practitioner hours and telemedicine services for use in treating residents. Portland Housing Authority provides rental assistance to all of the residents to make the rent affordable. MEREDA: What was the impetus for this project? Huston Commons: The impetus for this project was an urgent need for safe, affordable, permanent housing for homeless individuals in Portland. The target population for Huston Commons is disabled, medically-vulnerable individuals who are experiencing chronic homelessness. There is an immense need for permanent supportive housing for chronically homeless individuals in the Portland area. The number of people seeking emergency shelter has increased by 20% over the past four years, and City shelters have been full for years, creating the need for the continued maintenance of overflow shelters. These overflow shelters have also become filled to capacity, forcing dozens of people to spend their nights sitting in chairs in local government offices or worse. Maine’s most recent annual Point-in-Time survey identified 1,200 experiencing homelessness statewide, and more than half identified themselves as having a chronic disability. In Portland, 497 people were identified as experiencing homeless, and 48% had a chronic disability. A Task Force on Homelessness was formed by the Portland City Council in December 2011 to create a strategic plan to prevent and end homelessness, and one of its key recommendations was the development of three “Housing First” projects with in-house supportive services for residents. Huston Commons represents the first of those three projects. Studies have shown that such Housing First projects achieve savings by reducing the need for shelter stays, emergency room visits, jail stays and mental health hospitalizations. MEREDA: That sounds like quite a process. How long were you in the planning stages before construction started? Huston Commons: We began working with City officials to identify a site in early 2014, applied for and received an allocation for tax credits in late 2014, received planning board approval in July 2015, and began construction in April 2016. MEREDA: Tell us about the most challenging aspect of getting this project completed. Huston Commons: Huston Commons had a unique development challenge in that the property it sits on had three separate zones running through it. Avesta Housing worked closely with the City of Portland to convert the three zones into one new zone to allow for the construction of Huston Commons. Huston Commons: Working with mentally and physically handicapped individuals who have been homeless for as much as a decade prior to moving in presents copious challenges that need to be addressed by the entire team – property management, support services, etc. MEREDA: Now that it’s complete, what feature of the project do you think makes it the most notable? Huston Commons: The number of people seeking emergency shelter in Portland has grown 20% over the past four years. Homelessness is a growing problem with shrinking budgets and solutions. All 30 units are restricted to individuals who have experienced chronic homelessness and have medical challenges. Needless to say, Huston Commons filled up rapidly. Between Avesta’s three Housing First properties in Portland, there are over 100 people on the waitlist – all of whom are homeless today, most of whom have been homeless for quite awhile. The feature of this project that is most notable is its ability to serve our community’s most vulnerable residents with the help of unique organizational partnerships. December 11, 2018 at 8:00 am · Shelly Clark · Comments Off on Thinking about renting space to a marijuana operator? Take care and consider these important caveats. Thinking about renting space to a marijuana operator? Take care and consider these important caveats. By Hannah E. King and Edward (Ted) Kelleher, Attorneys at Drummond Woodsum. The marijuana industry poses profitable possibilities and serious challenges to the real estate industry. As Maine continues to work on the regulatory structure of its recreational marijuana marketplace, a land rush has already started as businesses begin to position themselves for legal marijuana sales. Warehouse space for cultivators and processors and downtown storefronts for potential marijuana retailers are renting out at multiples of usual market prices. However, while the economic excitement is justified by the track of record of the marijuana industry in other states, here are some important caveats that should be considered soberly and clearly by any property owner thinking about renting space to a marijuana operator. Federal illegality: Marijuana is still completely illegal under federal law. Every business person growing, processing and selling marijuana under a state legalization regime is breaking federal law every day. The Obama administration had a cautious hands-off policy toward the industry, but the Trump administration position is very unclear. Landlords expose themselves to potential direct criminal liability, and also the risk of civil asset forfeiture. The practical reality of these risks is hard to assess. One clear guidepost however, is that if tenants are violating state law, by for example, growing or selling more than they are allowed to, selling over interstate lines or selling to minors, they attract law enforcement attention and put the landlord at risk as well. Thus vetting tenants is even more important in this industry than usual. Additionally, the federal illegality of marijuana may affect things like the ability to get title insurance, to get property and casualty insurance at affordable rates and many commercial banks are beginning to expressly prohibit marijuana operations in properties they finance. Municipal control. Under Maine’s marijuana laws, municipalities have enormous power to regulate marijuana operations within their jurisdictions. Many Maine towns have moved very slowly and have not yet grappled with zoning or local permitting issues. Tenants and landlords both need to understand what kinds of rules and processes the local municipality will put in place, and what kinds of obligations these rules will impose on property owners. Operational concerns. Marijuana cultivation creates odor issues and uses huge amounts of electricity for indoor lighting. Cultivation and retailing both pose security concerns because of the valuable nature of the product and the cash-based nature of the businesses, since marijuana businesses have difficulty getting credit card services. Landlords need to understand the operational issues posed by these kinds of businesses and make include appropriate lease provisions to address them. Timelines. The Maine legislature approved a final version of the legalization law in May 2018. Now, the State is in the process of creating the specific rules that will govern the recreational marijuana industry. The rules will likely be final at some point in mid-2019. The state then needs to accept and process licensure applications, which likely means first sales of recreational marijuana in Maine in early 2020. This schedule, could of course, slip farther out into the future. Landlords and tenants need to recognize these timelines since they directly affect the ability of a location to produce the cash-flow that will support rent levels. The marijuana industry has caused excitement in many circles in Maine because of the economic potential just around the corner, but care must be taken, especially by landowners, in assessing and jumping into this business.